Winners of the 2018 BOP Dairy Industry Awards at the regional field day. 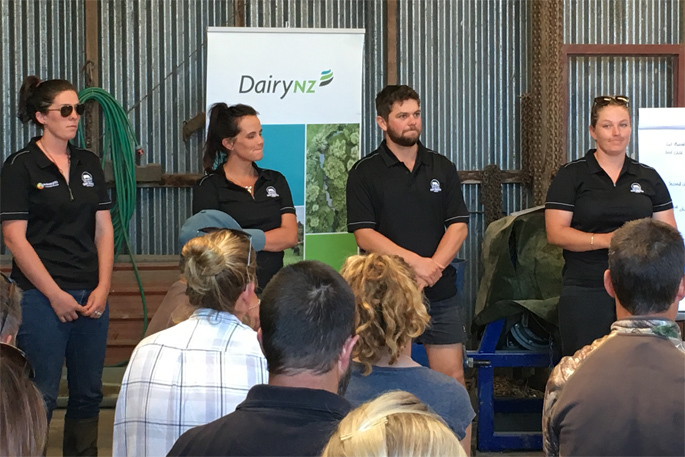 Twenty people will be telling judges about themselves, their roles, goals and achievements on-farm this month as judging gets underway for the three categories of 2019’s Bay of Plenty Dairy Industry Awards. But DIA regional awards manager for the BOP, Jodie Mexted says the goal is no longer to win an award – that’s bonus if it happens. Really, the awards are all about learning, connecting and growing – and they’ve changed the event’s motto to demonstrate this. “The awards motto used to be ‘Passion for progression’. This year it is: ‘Learn, connect, grow – and this really sums up what the awards are about. Jodie says this year entrants are from Whakatane, Opotiki, Matata, Galatea, Waimana, Te Puke and Pongakawa. The BOP regional preliminary judging round for the Dairy Trainee of the Year category is February 14, followed by Finals judging on February 25. Preliminary judging for both the Share Farmer and Dairy Manager of the Year categories is on February 12-14, with finals judging on February 26-28. Jodie says entrants in the DMOTY category have judges come onto their farm – and they have 1.5 hours to present what they do, to them. “You can get them to meet at the cowshed or in the paddock etc and take them through whatever you’re been working towards or are in-charge of on-farm. Jodie says while some enter to competitively vie for the top honours, many enter as a benchmarking exercise for not only their businesses, farming careers and operations but their personal lives. “I am not competitive, but I entered in 2012 for Dairy Trainee of the Year – and I actually learned so much – it’s basically free education. “This is why we try not to say the word ‘competition’ anymore – we call it the awards programme – because we also don’t want to turn people away from entering. Jodie says this quashes the idea people have to feel they’re at a certain stage in their farm goals or careers to enter. “It doesn’t matter what stage you’re at – you’ve got this huge opportunity to learn, connect and grow. BOP regional winners will be announced at a Regional Awards Dinner on March 13, at TECT Pongakawa, The Action Centre. Regional winners then go into national judging against winners from 11 other regions, with national winners announced in May.